Preheat the oven to 375 degrees F (190 degrees F). Lightly grease a 9x13-inch baking dish. 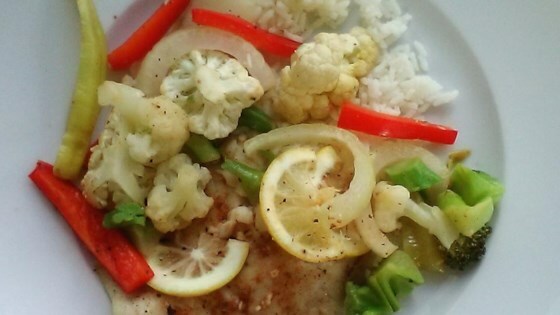 Place tilapia fillets in the bottom of the baking dish and season with seafood seasoning. Melt butter with garlic in a small bowl in the microwave, about 30 seconds on medium; pour over fish. Top each fillet with a slice or two of lemon. Arrange the frozen mixed vegetables around the fish, and season lightly with salt and pepper. Cover the dish with aluminum foil. Bake in the preheated oven until vegetables are tender and fish flakes easily with a fork, 25 to 30 minutes. This recipe is a healthier version of Easy Baked Tilapia. Was pretty good, but a little bland. Absolutely perfect meal to make for a quick colorful plate of something light on the stomach! Loved it!! Awesome recipe -- quick and easy on a weekday. I served with butter and herb rice and broccoli. Will definitely use again, thanks! Easy to make & it was super delicioso. Loved every bite.